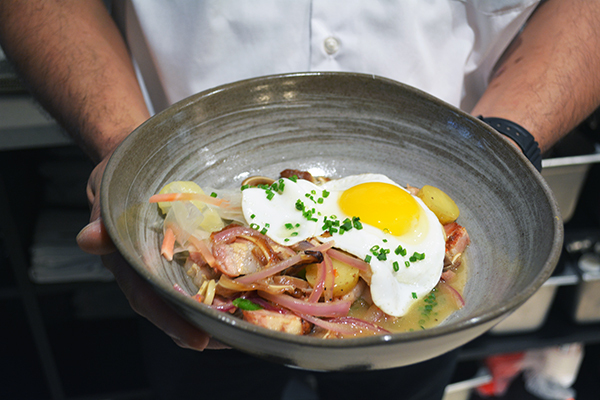 Kyirisan, a restaurant opening in Shaw, serves French–Asian fusion cuisine. Kyrisian, a new restaurant located near Howard University, serves a fusion of Asian and French food. 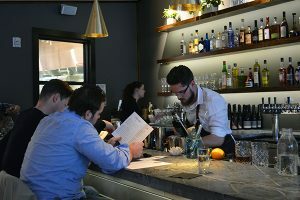 The restaurant, which opened last month, combines two cultures in a chic interior. Restaurateur Tim Ma opened the joint with his wife Joey Hernandez, The Washington Post reported. The dinner crowd included a few college students, some young professionals and an older couple. The restaurant wasn’t overwhelmingly crowded, though. Even if it’s a bit of a trek, it’s worth it if you want to feel chic for a night. The menu is diverse, encouraging customers to try things slightly outside of their comfort zones. When I first entered Kyirisan, located at 1924 Eighth St., I was impressed by the sleek, wooden interior. Everything was accented with gold decorations, like the lights hanging from the ceiling, which give it a modern, upscale vibe. It reminded me a lot of Momofuku, but on a much smaller scale. I was tempted by many dishes on the menu, including the cauliflower tortellini ($16), hanger steak ($19) and langostine (a small type of lobster) ($18). But ultimately, I decided on the deep-fried tofu ($9) as an appetizer, which arrived 10 minutes after I ordered. The presentation was as clean and crisp as the decorations surrounding me. The tofu was soft and chewy, but the breading outside added a crispy texture. Because tofu is flavorless, the black pepper sauce was the only thing I could taste in this dish and it was a bit spicy – I was constantly reaching for my water. For dinner I ordered the Cacio e Pepe, ($18) as I am a pasta lover through and through. The perfectly al dente angel hair pasta was so slippery that it almost fell off my fork. It tasted buttery and cheesy, and the topping of truffles added a smoky, salty flavor to the dish. Do not skip dessert. I decided on the custard cheesecake ($9) – because you can’t go wrong with cheesecake – and I was not disappointed. The presentation was so beautiful, I almost didn’t want to eat it. There was a swipe of hazelnut ganache on one side, and the cheesecake was situated in a pool of hazelnut butter – which tasted a lot like peanut butter. The cheesecake was perfectly light and fluffy, just as a cheesecake should be. It wasn’t overwhelmingly sweet and was delightfully creamy. Kyirisan is also the perfect middle ground for college students. It provides delicious fare, but not at a crazy expensive price. Some of the dishes, like the duck leg confit ($26) can be pricy, but others such as the wings with creme fraiche ($9) were pretty affordable.